These Instruments were introduced for use in Western Australia from approximately 1896. They were versitile instruments and found favour in what were termed 'colonial' railways of the day - India ; Argentina ; Australia and New Zealand. They could be used for both Double line working and Single line working, the difference being the removal or provision of a single wire inside the instruments. Mostly however, these instruments were used as Double Line Block instruments in Western Australia. Whilst the instruments were designed to be connected to the Starting Signal of the Block in Advance, this Author cannot find any cases in W. A. were this was done, therefore these instruments then, were merely indicators as to the state of the line between the two adjacent stations as mentioned in the Block Working Theory page. Introduction of Sykes’ Lock and Block Between Fremantle and East Fremantle. On Sunday, 20th July, 1902, at 10.40 a.m., the present system of signalling by means of Winter’s Absolute Block will be cancelled, and the Lock and Block system introduced on the following section, in accordance with the instructions laid down in Addendum No. 1 to the General Appendix: - Fremantle - East Fremantle. (Excerpt from) Copy of Circular No. 500, dated 18th July, 1902. Page 16, Weekly Notice 31 of 1902. 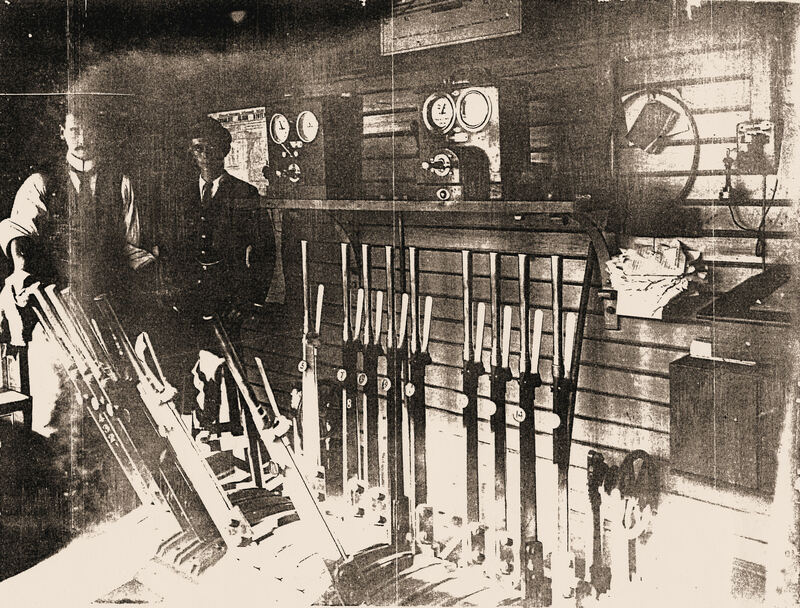 Photographic evidence now also supports the fact that Winters instruments were used elsewhere on the Eastern Railway as this picture of the interior of the Maylands Signal Box will confirm. 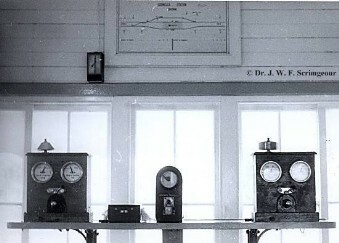 Note in this photo that the right-hand (to Mount Lawley) instrument is of the type used on the Victorian Railways as it has the protruding plunger and side-handle 'On' - 'Off' switch. This is the first evidence found of the use of these instruments in Western Australia. The left-hand instrument is of the standard type used by the WAGR. "In regards to the Winter’s Two Position Block, there was a Victorian Pattern Instrument at Maddington on the Up/ Down side to Cannington. This instrument, instead of having a front switch, had a handle which moved from the rear to the front, and was fitted on the left side of the instrument.